Sophos released data about malware on Macs. Using a sample of 100,000 Mac computers running the free Sophos anti-virus tool, the company discovered that one in thirty six, or 2.7 percent, of Macs carry Mac OS X malware. Interestingly, the security firm also found that one in five Mac computers harbor Windows malware. New research released by Sophos has revealed a disturbingly high level of malware on Mac computers—with both Windows and Mac threats being discovered. Sophos experts analyzed a snapshot of 100,000 Mac computers running its free anti-virus software, and discovered that one in five machines was found to be carrying one or more instances of Windows malware. Although Windows malware on Macs will not cause symptoms (unless users also run Windows on their computer), it can still be spread to other computers. 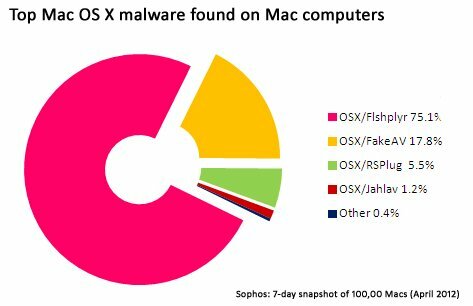 Additionally, Sophos's analysis shows that 2.7 percent (one in thirty six) of Macs were found to be carrying Mac OS X malware. The recent Flashback botnet, which inflicted more than 600,000 users, and fake anti-virus attacks, which scare users into handing over their credit card details, dominate the chart of Mac-based threats. "Mac malware can spread via USB stick, email attachments, website download, or even a silent drive-by installation where the user doesn't realize their Mac's security has been subverted," continued Cluley. "Cybercriminals view Macs as a soft target, because their owners don’t typically run anti-virus software and are thought to have a higher level of disposable income than the typical Windows user. Mac users must protect their computers now or risk making the malware problem on Macs as big as the problem on PCs." Some of the malware discovered by Sophos on the 100,000 Mac computers sampled dates back to 2007, and would have been easily detected if the users had run an anti-virus product sooner. Bredo, a family of malicious programs sent out via spam, accounts for 12.2 percent of malware detected on Mac computers. The first Bredo variant was detected in 2009, and since then, countless variants have been released. Only last week, it was used in a malicious email campaign that purported to have attached a compromising picture of the recipient. "The simple fact is that you can scan your Mac for infection from your armchair. The test is painless and free; you just download an anti-virus product and allow it to check your computer and protect it against infections in future," explained Cluley. Home users can join the millions of others who protect their computers by downloading a free version of Sophos Anti-Virus for Mac from: http://www.sophos.com/freemacav.